While nail polish is obviously close to my heart, how can you deny a little lovin' for your other bits- specifically your hands and body? 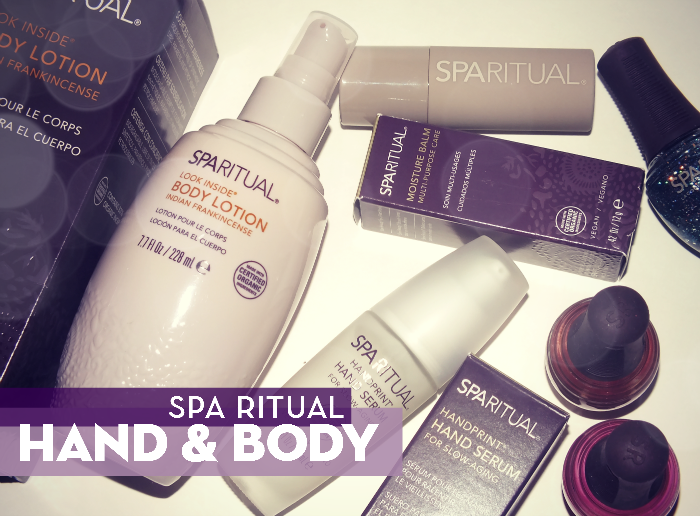 If you didn't know, Spa Ritual is much more than just polish- they have a pretty extensive range of products. I've been using a few including Look Inside Indian Frankincense Body Lotion, Handprint Hand Serum and Moisture Balm. Read on! Who loves a multi-purpose product? 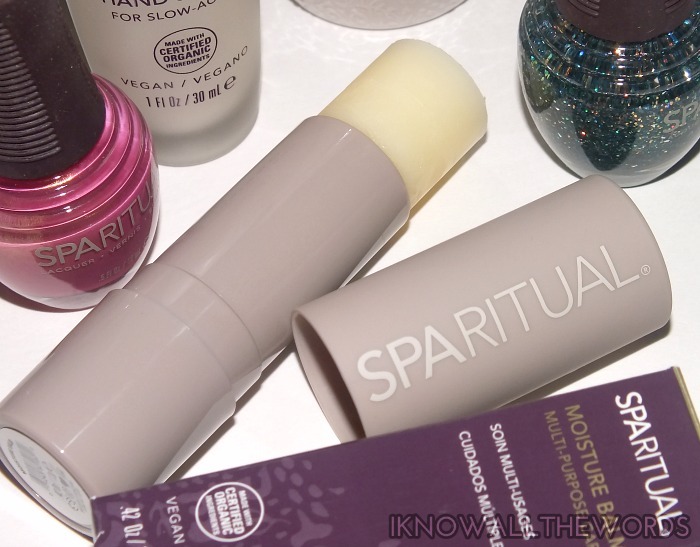 I know I do, and the Spa Ritual Moisture Balm is defiantly loveable. It's a balm formulated with fair trade certified ingredients including organic Shea butter, and cocoa seed butter (along with a whole host of skin loving oils- jojoba, avocado, rosehip, coconut etc.) to deeply hydrate and protect dry skin on hands, feet, lips and body. I usually don't like using balms like these on my lips- more of a 'it just seems odd' thing than anything really- but this works amazingly well on dry lips. Of course, it works quite well on other dry areas too- the balm softens against the warmth of your skin allowing the buttery balm to melt into skin. I quite like to apply this to elbows, heels and feet in general, and cuticles. For such a buttery feeling balm it absorbs quite quickly and doesn't leave an oily feel on skin. While this balm is vegan, and free from synthetic dyes, parabens, petrochemicals and fragrances, it does have a fresh and citrusy scent from the orange and lemon oil. 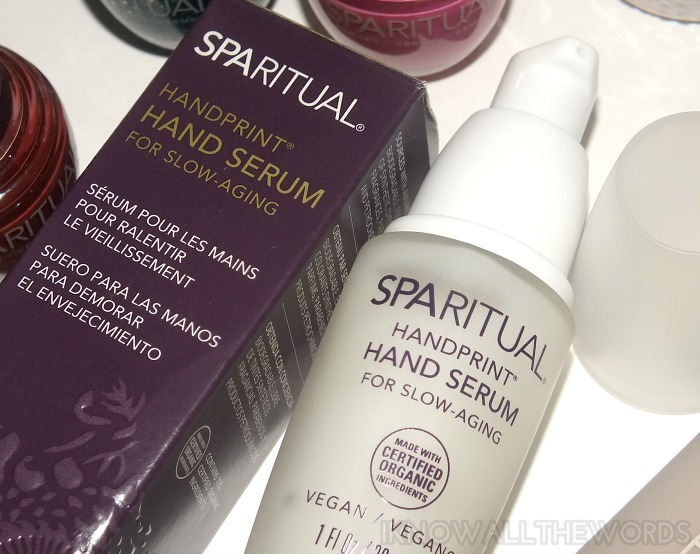 Serums have become some of my favourite products in my skincare routine for my fave, but before Spa Ritual Handprint Hand Serum, I'd never used on for my hands. The idea does make total sense thought, as the hands are one of the fist places to show signs of age. This serum is formulated with Swiss apple stem cells and ginger root extract to soften and smooth skin's texture while building collagen, promote elasticity and treat discolouration. The texture is that of a milky, gel-cream with a light feel that absorbs easily into the backs of hands. While it is to be used with under a hand cream, this instantly makes hands feel softer and smoother. Not wanting to leave the body as a whole out of the fun, we end with Spa Ritual Look Inside Indian Frankincense Body Lotion. Spa Ritual offers a range of products in four different families, which they call 'States of Slow Beauty' being Close Your Eyes, Look Inside, Instinctual Self, and Infinitely Loving. Each state incorporates a colour palette of polishes and a specific scent. Overall, I am very impressed with these products! I'll admit I wasn't that familiar with anything other than the Spa Ritual nail polish, but the skincare items are fabulous. These are a great option for anyone seeking vegan products made from natural, organic ingredients. Tired any of these products? Have a favourite Spa Ritual product? Do share!